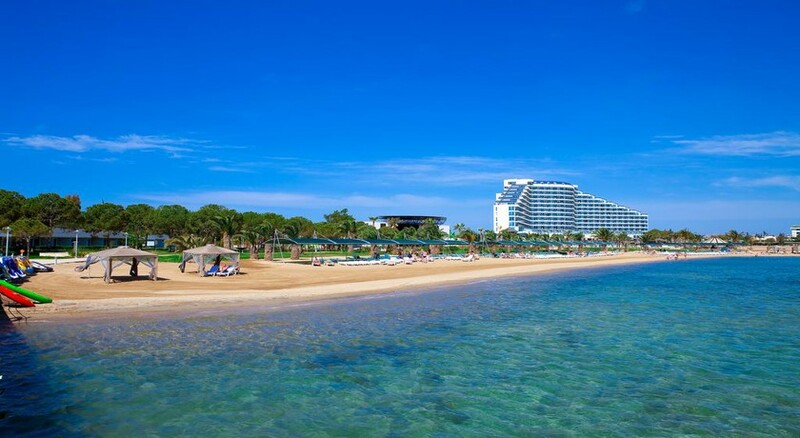 The Venosa Beach Resort & Spa Hotel is a sea-facing, family friendly property offering luxurious accommodation with fabulous facilities on the beautiful Aegean coast of Didim-Altinkum in Turkey. Set amidst lovely gardens and with its own private beach, this is a couple and family favourite for unforgettable fun in the sun. Rooms are spacious and enjoy beautiful views of this stunning part of the Turkish coastline, the pool or gardens, and boast modern condos which include satellite LCD TVs, a minibar and air-conditioning. With indoor and outdoor pools there are plenty of places to chill out and the wellness centre and spa ensure your gym kit is put to good use. Try the on-site Jacuzzi and hammam for the ultimate Turkish bath experience. This property is situated in an idyllic location right on the beach. 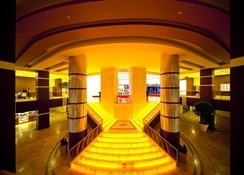 The resort is 80km from Bodrum-Milas Airport. The city of Izmir is 140km away. Nearby, in downtown Altinkum, there are an awesome collection of bars, pubs and clubs. On foot, the hotel is 3 minutes from the beach. 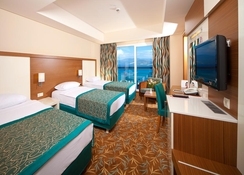 The Venosa Beach Resort & Spa has 306 guestrooms which may be standard, double or family rooms. The rooms are equipped with a balcony or terrace with sea views, a hairdryer, split air-conditioning, a mini-fridge with water only, a safe deposit box, shower, satellite TV and a telephone (with charge). Rooms are cleaned daily and towels changed. The hotel boasts four dining venues – there is a buffet style main restaurant, an a la carte restaurant, snack counter and five bars. 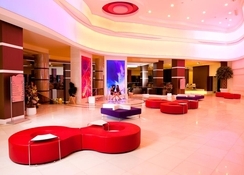 The hotel has ample amenities for fun and relaxation for guests of all ages. These include an outdoor swimming pool, children’s pool, water slide pool, sunbeds and umbrellas, towels and an indoor pool. A private beach area equipped with sun beds, parasols is available for guests. There are facilities for diving, pedalo and other watersports on the beach. A fitness centre with facilities like aerobics, water gym, basketball, billiards, tennis, table tennis, volleyball is present for the recreation of guests along with a spa providing massage, sauna and Turkish bath. There is a mini club to keep the tiny tots occupied. An animation team organizes events and shows during the day and night. At night, the in-house disco is the perfect place to set the tiles on fire. Guests can collect keys from reception.